The pickups in your guitar are as important as any stompbox and a good set of quality pickups can do wonders for your tone. California based D. Allen pickups has gained a lot of praise lately for their hand wound custom pickups and I recently got a couple of sets that promised classic Gilmour tones. Hereâ€™s my review of the Tru Vintage 54, 69 Voodoo and Voodoo Blues. Choosing the right pickups for your setup can be a challenge. You might realize that the pickups you finally decided on doesnâ€™t sound anything near what youâ€™d expected. All of my Strats has featured Fender CS69s at one point and all of them sounded different. The reason is that thereâ€™s no such thing as two identical guitars. Even though they have the same wood, contour, lacquer etc, there are all these little nuances that creates a unique tone. So what pickups should you choose? Well, that really needs to be your decision, based on the gear you have but one thing is for sure â€“ hand wound quality pickups will always be a welcomed upgrade. All D. Allen single coils are made by hand, making each bobbin with laser cut fiber flatwork, hand beveled alnico magnets, scatter wind, wax pot, use USA cloth push back hookup wires, finish off with a fabric tape. The tone character is designed in close relationship with guitarists and by meticulously studying vintage models. The Tru Vintage 54s (alnico 3) are based on the pickups featured in the very first line of Fender Stratocasters. These are known for their glassy transparent tone with a rounded lower end and a hint of mid range. This is instant surf and Shadows but also a perfect match for Davidâ€™s legendary #0001 Stratocaster. Iâ€™ve always been a fan of the 54s and in my opinion theyâ€™re ideal for big pedal boards when you want a transparent tone as possible. They can sound a bit thin and bright though. Especially if theyâ€™re combined with maple necks or if youâ€™re used to hot overwound pickups or humbuckers. However, the Tru Vintage 54 has an incredibly smooth top that stays creamy even when you crank the amp really good. The fat lower end and slight mid range makes them very dynamic and versatile â€“ almost to the point that you forget that these are indeed low output vintage style models. Highly recommended if youâ€™re desperately seeking that Stratpack 2004 tone or simply a set thatâ€™ll cover most of Davidâ€™s 70s tones. The 69 Voodooâ€™s (alnico 5) are based on the late 60s Fender pickups employed by Jimi Hendrix, David Gilmour, SRV etc. Recognized by their transparent tone, thunderous lower end and crisp top, this is as close as youâ€™ll get to Machine Gun and Echoes! Over the years Iâ€™ve become more and more fan of the 69s. Although similar to the 54s, they respond even better to tube amps and high gain pedals and the boosted lower end makes them slightly warmer. Having used numerous different Fender 69 clones over the years I must admit that the Voodooâ€™s gave me a huge grin when I plugged in my trusted Strat. These are so scooped (middle frequency rolled off) that they can easily be mistaken for John Mayerâ€™s Big Dippers. I also think Allen has better achieved the balance between the punchy lower end and the fairly bright top, which sometimes can be hard to combine with certain pedals. Recognizing that many players feels that the stock bridge can be just a tad too bright, D Allen has beefed it up from the usual 5.8k to 6.2k. Not a huge difference but enough for the pickup to sound considerably warmer with just a hint of mid boost. The Voodoo Blues set feature a neck and mid 69 Voodoo (both 5.8k) and a slightly overwound bridge pickup (7.58k) wound with extra thin thread to bring out the dynamics. A common complaint about the late 60s pickups, is that while the neck and middle sound fat and well balanced, the bridge often sound thin and spiky. The Voodoo Blues bridge is designed for a higher output and smooth, creamy mids while still maintaining that classic late 60s tone with a distinct, bright top. The Voodoo Blues is very close to what you’d get from combining Fender CS69 with a Duncan SSL5. However, the Voodoo Blues bridge sound much more open than the SSL5, which on some guitars can sound just a bit too dark. I must say that I prefer that dark tone but the Voodoo Blues bridge is probably a better choice if you’re running lots of pedals and cables that kills some of those top frequencies. I always try to stress the importance of a good sounding guitar and amp. This is a much better and longer lasting investment than any pedal. After all, playing an instrument is about inspiration and no pedal will sound inspiring without a good basis. This, however, doesnâ€™t mean that you need to blow all your savings but a guitar that youâ€™re comfortable with will sound even better with proper pickups. A good rule when you buy a new guitar is to focus on the comfort, playability and how it sound acoustically. If the pickups do sound good, then you got yourself a bonus. If they donâ€™t then I strongly suggest a new set of good quality hand wounds. For me, good quality pickups can be measured by how well they respond to your picking technique and whether they maintain their character when you adjust the guitar volume. Dave Allen has got me convinced with his great sounding pickups. Highly recommended! 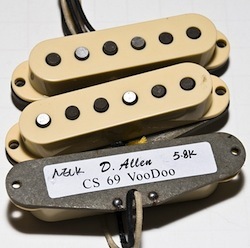 Check out the D. Allen Pickups website for more details and ordering info. TruVintage 54s: David Gilmour performing Marooned at the Stratpack show, Wembley Arena 2004. #0001 1954 Stratocaster with Demeter Compulator, Chandler Tube Driver and MXR digital delay into a Hiwatt+WEM setup. VP 69 Voodoo’s: Pink Floyd performing Echoes from the Live at Pompeii film, 1971.. The Black Strat clean for all the rhythms and a (silicon) Fuzz Face with Binson echo for the leads into a Hiwatt+WEM setup. Voodoo Blues: David Gilmour performing Then I Close My Eyes at Royal Albert Hall, 2006. The Black Strat with Demeter Compulator, BK Butler Tube Driver and delay into a Hiwatt+WEM setup. David produces fine pickups, but … his attitude towards customers is surprisingly unacceptable. The second month went by as I paid for the order. He received the money. The order sees. But no money. nor the execution of the order. No letters from him. Nothing. Neither Lindy Fralin, nor Jason Lollar, nor Klein did not allow this to themselves. Sorry to hear. I haven’t been in touch with him for some time but he always seemed professional to me. This is a surprise to me. I emailed him a few times and always got helpful replies. Hope you get this resolved! He made a custom set up for me and he was very professional and even called me to discuss the project. Very nice guy. He has been very prompt and courteous when I contacted him. I ran into the same problem. Ordered some Blades about three weeks ago. After two weeks and no order and no email saying the order had shipped I attempted calling and emailing. Zero response. So my take on this is he’s quick to take the money but a he’s a real non event when it comes to customer service. I don’t know if I will ever get my order but at this point it doesn’t matter. I don’t care if these pickups sound like God’s guitar I’ll never purchase from D. Allen again. In this day and age it’s too easy to get way better customer service than this. From the posts below you guys must have caught him in a good week and that’s great. But unless he’s had a death in the family or is in the hospital himself, later…. Hi Bjorn, thanks again for your wonderful thorough review. I am amazed by the level of your knowledge, skills, and dedication for putting so much time and effort offering such valuable information for guitar players in your web pages. You are awesome man!!! I had my ’96 Fender Am Std. at an authorized Fender guitar repair shop in Calgary for basic setup and fret dress. I also decided to go with the flow to get the pickups upgraded. SSL-5 for bridge and CS69 for the neck. I left the mid pu as stock since I wasn’t using it much. I must say SSL-5 cuts through all the low mid range of the dirt pedals with strength and expression so well. I love the clean tone of CS69 but with the same setting for dirt pedals when I switch from bridge to neck position, I must admit it sounds a bit too muddy. I know it is the nature of the neck position but I thought I pick your brain: A- if Voodoo 69 neck position cuts through better than CS69, B- if you use EQ pedal or booster pedal when you switch from bridge to neck, C- if you set your pedals to create a middle ground for both pu positions i.e. not making it too fat sounding on the bridge position and not too bright sounding for the neck position so it works equally well for both. In my case, I have a big muff issue with the neck position. If I set it sounding good with bridge pu, then at neck position it sounds muddy and lacks enough expression and details. The other issue I have is a bit too much neck pu CS69 stratitis with the strings that the magnets are sticking out (G and D strings). I brought down the pu to about 2 mm above the scratch guard (around 3 mm clearance from top of the string to top of the magnet in the last fret position). Still I get some. I’m wondering if Voodoo 69 has less stick out G and D string position magnets and overall you found it sounding more uniform across all strings. Thanks a lot. In the context of my band where the other guitarist is playing a telecaster my Tokai Strat (1984, maple neck, with its original pickups) is sounding really thin and weak (both using similar fender hot rods). I’m happy with the tone of the guitar but it does seem to be over powered. I often find I need to engage my boost pedal to get enough punch in the bridge position when playing the riff for ‘Superstition’ or ‘Sweet Home Alabama’ intro. The Sultans of Swing solo just gets completely lost in the mix. I am currently having a refret done as well as upping the gauge from 9’s to 10’s. I’m convinced this will help but probably won’t fix the problem so I’m also looking at pickups. Reading your reviews and comments there are lots of pickups I believe would do the job, however we actually play a huge variety of covers including many modern bands like..Killers, Kings of Leon, Black Keys, Foo Fighters to name a few. Versatility is therefore key. The Voodoo 69’s have been on my radar for a while but I’m interested to read about the Voodoo Blues bridge pickup. To be honest I am really confused. I love gilmour/Hendrix tones but I’m not playing any in the band. I definitely need something hotter than I have but mine may just need a rewind. I’m reluctant to go down the SSL-5 route. Hi Mike, sorry for my late reply. You say telecaster but I’m sure you mean Stratocaster? I’m actually more interested in what amp you’re using. If you feel that your tone lack punch and it’s hard to cut through then it sounds to me that you might lack mid range and perhaps also some compression. Songs like Sultans of Swing definitely need a lot of compression to get that twangy tone and for the cleans to really stand out. Your pickups is probably fine and I’d start by tweaking the amp for a bit more mids and also add a compressor to your setup. You might also want to look into gain effects that has a pronounced mid range. They’re single coils so they will pick up whatever sources of noise that’s nearby but no more than other single coils. I have all of my Strat’s shielded, which helps a great deal. I finally figured out the question that’s been stumping me since I first heard of a Strat pup with the output of 12k+ like the SSL-1c, SSL-5, and D.Allens bridge. It hit me out of the blue yesterday. The more you overwind a pickup, say 10%, it gains 10% output, 10% mids, and loses 10% highs, making it darker, which makes cutting through floyds wall of sound much easier on David’s single note solos. Midrange cuts through, and the lower high end, keeps the bridge from being too icepicky! Now I finally get it! And also earlier in this thread I said that, 022 uf caps worked best, it may have been a bad cap, but Cymbaline wouldn’t get the laughing sound, and I changed the cap to the. 047, and I’m seagull city now! on my black strat (maple neck) i am using fat50/cs69/ssl5 and i don’t want to change it. the other strat (rosewood) has three cs69 and i am not so happy with the bridge-pu. will it make sense to use a texas special bridge pickup? or would it be wise to switch to a cs54 set because this 2nd strat should sound different from my black one? Thanks, that’s kind of what I thought your explanation would be. So basically for the period I’m most interested in, 68-77, The Fralins output is pretty close to what he was using. I would like to try the extra hot bridge though, probably great mid punch for solos, especially in live situations, with a loud band. I may see what Lindy can come up with, or check out one of D Allens new 12.5 tapped pup. pup,.You must have originally used a milder, and more vintage lower output bridge pup before you went to the SSL-5, so you are the perfect person to ask. Isn’t 12.5k just a bit too hot? Oops my bad. I didn’t read the previous comment… I’m definitley looking forward to your review of the echos set. I’m definitely thinking about getting a set myself. I bought a set tru vintage 54s for my strat and I love them. 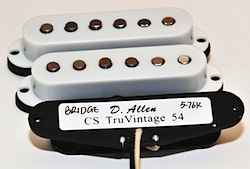 I think Dave Allen is producing some pf the best strat pickups on the market today. I see that DAllen has produced a new set of pickups called the Echos. Which is based on replicating the pickups on the back strat. It has 69 voodoos in the neck and middle and the bridge pickup is wound to a similar output as the 69 but also the tone knob I believe features a push pull button that adds extra winds to the bridge making it more possible to get both his tone from the 60s as well the creamier higher output bridge tones that he gets today. The idea behind this set is definitely exciting. I was wondering if you were gonna review this set, because I’m definitely curious how well the push pull button on the bridge works. Check out the new Echoes set with a double tap bridge so you go from the VooDooBlues setting to a 12.5k bridge with push or pull. Thinking in buying two ’69 style pickups to go with a SSL5 I have hanging around. Why the Fender CS? I had the fenders once and I though they sounded great and their price is great but thinking in buying a boutique option if it they worth it. Thinking about Klein 69s (have a set of his 54 and 65 and they are great pickups) or even the new Dave Echoes set. Thanks for your great web site. Here’s a demo of my new “Echoes” set of guitar pickups by D. Allen. Strat loaded with the Echoes using the (hot) bridge position into a Big Muff into a delay through a ’72 Fender Twin Reverb doing the first solo of the studio version of Comfortably Numb, which the tone of has eluded me for 30 years (until now, thanks to Dave Allen), just playing along with a backing track recorded open air…. Hello there, I know this is an older thread, but has anyone had luck with the Fender N3 pups? I know that JB is using these in his backup guitars. Not very many useful videos on YT. No effects on this demo – just the guitar into the amp – I’ll be doing an “effected” version in the next couple of days. I was pleasantly surprised to see that you reviewed the Voodoo Blues set – I actually worked with David Allen in developing them. I had written to David about what I was looking for to fit a certain guitar of mine, and was wondering which of his sets would fit the bill. He didn’t have a set that fit exactly, so he started experimenting using my ideas and came up with the Voodoo Blues. He liked the finished results so much he decided to add them to his lineup and the rest is history. We didn’t have Gilmour in mind when we were working on them, but in hindsight I guess it’s the same basic concept of a late 60’s neck and middle and hot bridge. As Tony mentioned above David has got an “Echoes” set in the works, so I’m really interested to see how they turn out. His workmanship is top notch and his customer service is out of this world. BTW: His soon to be released “Echoes” set will be very similar to the Voodoo Blues with a hotter bridge. I am hoping for the bridge will be a cross between the SSL-5 the SSL-1 and Dimarzio FS-1 but with improved quack in position 4. This would be a dream come true. No problem David, I’m not a tech, but I eat information. Since becoming a Gilmourish reader a little over a year ago, I’ve studied, and called people I thought unreachable with questions. I found the information from my Luthier, Tom Rodriguez, and my pickup builder Lindy Fralin. No one seems to understand Fenders use of the higher value small caps, and both people I spoke to said that the. 022 can style caps indeed keep more of your high end in tact, and let the real sound of the pickup through, without sacrificing bottom end. My guitar has CTS 250k pots, and the .022, and It’s the quietest, most open sounding Strat I’ve ever played, and I’ve owned over 20 American, and MIM’s. Another thing I’ve not heard anyone speak of is a bass plate for the bridge pup. If you check out Lindy Fralin pickups, hey explains the benefits of a bass plate better than I could, but it basically allows him to wind the pickup for great bass response, without sacrificing highend tond. There is evidently always a trade off one way or the other when winding bridge pups. I’ve done a lot of research on this lately, as I’m gearing up to assemble my first Warmoth Start. Tone caps receive a lot of press if you search the internet. Basically there are camps that say the capicator is very important to the tone, and others that say it has no bearing on your sound. I’m not going to get into that part. The most important thing about the cap is it’s value. The larger the value, the more high end it will roll off as you turn the tone knob. So a .047uf cap will cut more treble than a .022uf. Throughout the years, Fender has used many different values. In the 50s, I believe they used .1uf and as Kieth pointed out they later moved to .022. My 90’s model Strat Plus Deluxe has a .047. Another thing to consider is what the cap is made out of. Again there are conflicting and hotly debated sides to this. Old school, is paper in oil; these days you will probably find ceramic disks a lot more common. So, how to use this… Depending what value of capicitor Bjorn has in a specific guitar will depend on what he rolls the tone knobs to. If Bjorn says in an article that he rolled his tone to 4, but when you do, your’s sounds much different, it could be that your cap is a different value, therefore you may have to roll down to 2. Also saw a Peavy Classic 50 tweed, in excellent condition for $450 yesterday! 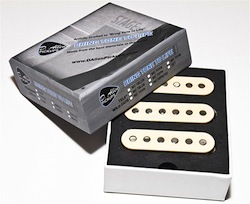 And didn’t know this, but until recently, TTS pickups were also made here in Richmond, Va. Seems we have a great deal of musical products made here. Look out for John Kelly handcrafted, hardwood, stained pedalboards, excluding my PP2, It cost me about $400.00, but is not only very functional, but beautiful, and huge at 18″x 36″! Some Boutique pedals will start rolling out of this town very soon as well! @ David D .022 for vintage Fender, with 250k pots! I’m really interested in buying the Voodoo Blues pickups. This will be my first time changing anything on my guitar. What capacitor value should I get with those pick ups; 0.033uF or 0.047uF? I’m after the 70s black strat sound. And also, what difference does it make in tone the value of the capacitor? Just a head’s up that Dave Allen plans to release a David Gilmour set soon. Very exciting. What pickups are you using at this time in your telecaster? Do you have any sugestions or coments?? Just wanted to thank you on your recommendation of the VoodooBlues set and find them nothing short of astounding. Extremely balanced, clear, dynamic and focused with loads of glassy sparkle and the tightest bottom I’ve ever heard. The bridge is a perfect balance of vintage Gilmour and Hendrix that have plenty of bite without the pick or losing quack in combination with the middle PU. All posistions work gorgeously with drives, muffs and fuzzes. These pickups seem to bloom more and more everytime I plug in my Strat. The craftsmanship and packaging were stunning and his customer service was far above and beyond. No doubt the finest pickups I have ever owned without even going into all the pickups I’ve tried chasing this elusive tone. In fact, I’m so impressed I’m going to give another set of his a try. A master of his craft no doubt. I know I must sound like an advertisement here but am simply a genuine Gilmour and Hendrix freak with 30 years playing and gear experience who’s wasted tons of time and money (no pun intended) that simply wants to help other from wasting theirs as well if they are seeking the same magical tone. My deepest thanks for your amazing ears and bringing gear like this to mine and the public’s attention. Would you recommend the Voodoo Blues Or Voodoo 69’s to cover Gilmour tones from Meddle through The Wall? I love his searing lead tone on the solos to The Echoes and the studio version of Time, but also love his woody, dynamic FS-1 tone on The Wall, but preferably without losing too much vintage quack in position 4. Also, besides the warmer bridge on the Voodoo sets, what have you noticed is different from Fender CS69’s? With your combination set of the VooDoo 69’s and SSL-5 on the bridge, did you install an 0.047 capacitor for the tone control pot? Thanks! Are yours the revamped ones they made 2007 and later? Mine was my first strat after being a gibson player for years and I love the large headstock, jumbo frets and nitro finish. Tons of sustain. I got the flat black finish. Doesn’t hurt that it’s a dead ringer for the black strat, circa Pompeii:). Curious if you’ve ever tried the ‘vintage hot alnico iii’ pickups that came stock in the highway one strat? I have a highway one and after months of planning to get around and add a duncan ssl5 in the bridge and possibly cs69s in the neck and middle, I’ve finally decided ‘if it ain’t broke, don’t fix it’. I really like these stock pups! The idea behind their design was to try to keep as much of a vintage strat sound as possibly while adding a little more ‘modern’ bite. However, I think these must be quite different from the texas specials. Have you ever played them or heard anything good or bad about these pups? They only really came in this one strat so there is not a ton of info out there. I hope all is well with the new addition :-) and you are getting some sleep! Let me know how you like the VooDooBluesset when you have some time. first i tried ssl 1 – it was too bright. then i switched to the ssl 5 – there was the g-string-problem … the g-string was much too loud und there was less treble. then i tried a fat 50 – same result as with the ssl 1.
now i saw that there is a ssl 6 which is a flat ssl 5. do you think this will help with my much too loud g-string on the ssl 5? Cool! I had no idea you had actually tried it. I know it is hard to talk about sound but I would be very grateful if you could describe the difference tonally (as in bass, mids, treble) between the regular 69 bridge (or something like the SSL-1 bridge) compared to the voodoo blues bridge pickup. I have a set of three Duncan SSL-1 in one guitar that I absolutely love but I’m looking to try something new in my newer guitar. I’m tempted to try out a hotter bridge pickup but I’m slightly worried it will sound to midrangey in an almost humbucker like fashion. Ideally I’d want something like the SSL-1, just slightly beefier (more output and bass). Do you know anything about D Allens Voodoo blues set? That seems to be the voodoo 69 with a hotter bridge pickup. I suppose it is hard for you to answer but do you think that that kit would be a valid alternative to the “Voodoo 69 + SSL-5” -kit? Happy New Year to you and your bandmates. Loved the review, just want to mention that these look like staggered pole-pieces, so us lefties would need to custom order the pups from the manufacturer. nice review, thanks. as for the the sound samples i do not understand so far: does gilmour play the david allen pickups? Yes, i agree with you Bjorn. I think that sometimes David use the P1 only with GE7 and sometimes P1+BK. Will be great try his pedalboard! Once again a very informative review on you site â€“ it am very curious about all the reviews that will follow during this year too. You are obviously a great fan of the Seymour Duncan SSL-5 â€“ I use that pickup too, but have chosen the tapped version (SSL-5T) which gives me the opportunity to recreate the vey old Gilmour sounds much easier â€“ I mean the time before he used the Dimarzio FS-1 (great pickup as well) and the customized Duncan Pickup. By the way â€“ on your site, you mentioned that you use Weber Thames loudspeakers in your old Soundcity cabinet â€“ and that you have replaced the old Fane Crecendos. Could you please tell me what the reason was for that swap and how do the Weber Thames sound in comparison to the Crescendos. I am not totally happy with my purple Fanes in one of my three SA212s and currently I am about to decide which speakers I should buy for my two other SA212s. Actually I would like to know how the Thames sounds treble-wise in comparison to the Crescendos. I prefer a speaker with a little bit more treble â€“ what would you recommend? Weber Thames or Weber FC-12. I am pretty sure that a lot of fans from your site would be curious to get a deeper look in your experience on loudspeakers. For the shine on you crazy diamond and dogs tone, would you recommend these over the crazy diamond set? Have you tried any of the Bareknuckle pickups? First, I want to wish you a happy new year and long life to your band..Second, i want to know with the 3 set of pickups that you’ve tested, is still your choice with the cs69 and ssl5 or would you do another mix? Thank you for your work .. really enjoyed it! Happy new year my dear friend. How do the Vintage 54 compare with the original pickups of my American vintage 57 strat?